Product information "HAIX Airpower XR1, FS"
These boots come from our factory seconds line - slight blemishes and imperfections may be part of this boot. Please see our HAIX Airpower XR1 leather fire boots for our full warranty-eligible boots. Developed with the wildland firefighter in mind, these fire boots can take you to the fire line and back with the comfort you need when logging long hours in the station. A dual purpose boot that is NFPA certified for wildland firefighting and EMS, you have the convenience of two boots in one. The newly developed cushioned insole offers the ultimate in comfort, especially when combined with the built in arch support. And with the laced in zipper system, any firefighter can adjust the lacing for a more personal fit while enjoying the benefits of a quick in and out fire boot. Because on the job, seconds matter. The HAIX® Airpower XR1 is both waterproof and breathable with the added benefit of chemical and bloodborne pathogen protection. Working in tandem with the HAIX® climate system, your feet will stay dry, comfortable, and protected thanks to this paramedic boots – even in times of extreme exposure to water. The Airpower XR1 offers all of the HAIX® quality you have come to expect for long lasting comfort and durability. The all leather upper material uses Sun Reflect technology which reduces the solar heating effect and keeps feet cool by reflecting the sun’s rays. The soles of the HAIX® Airpower XR1 are extremely slip resistant which offers an effective grip when exposed to water and oil. So even when you’re on a rescue and you’re running on tile, hardwood, or linoleum flooring, your paramedic boots will be able to grab hold. The insoles are anatomically formed to deliver a perfect fit and are made to provide excellent moisture absorption and as well as quick drying qualities. When the insoles of this EMS footwear gets completely dirty after long days on duty, all you need to do is throw them in the wash, air dry, and they’ll be ready the next day’s work. Related links to "HAIX Airpower XR1, FS"
Our comment on "HAIX Airpower XR1, FS"
Customer reviews for "HAIX Airpower XR1, FS"
After buying many other types of boots for our fire crews and hearing complaints about those boots decided to try HAIX and one of the best decisions made. Haven't received one complaint from anyone wearing these boots. Thank you so much. I snagged these seconds during the annual inventory, so a coupon plus free shipping to wait a few days for shipping. Best money on boots I've spent yet. The only guess I have as to why these are seconds is that the toe has flashing that wasn't smoothed out. I've worn them for 4 days straight at the firehouse and home, shoveling snow, responding to calls, chasing kids. They are very comfortable, cool enough in the station and warm at 10 degrees with lots of wind standing by on a structure fire. I wear a 12 in boots and a 13 in sneakers/tennis shoes. I bought these in a 12 just like the (not very durable) Thorogoods they replaced. Perfect fit. First pair of haix I have ever owned. pros: very comfortable boot. Easy to get set up. Good price. I have heard that they typically last 2-4 years. Cons: warmer than I expected (great for now being winter, I’ll update this review this summer). I wish the boot had a cleaner look something like the pro warrington station boot. I’ve had the same boots for 8 years and it was time to replace them. Some people I knew swear by these boots so I went ahead and took a chance. I love them! They are comfortable light, and feel good on my feet! Finally found a station boot that meets and exceeds not only the requirements of NFPA 1977 and our requirements and that our firefighters like. Excellent made product and outstanding customer service. Keep up the outstanding service. I am a police K-9 officer and the training and working with a dog takes you into some areas where you need special boots. I got these about a week ago and do to being made of all leather, they are a little stiff yet but very comfortable and fit comfortably. I could not see any blemishes, marks or scuffs, as they were considered factory seconds. I have not tested the waterproof ability of these boots yet but hopefully they will be, as I occasionally have to walk through water up to four or five inches deep. These are really great boots and I would recommend them. Thank you for your review of the Airpower XR1, FS. We are happy that you have found these boots to be comfortable even though they were a little stiff out of the box. This is because of the full-grain leather used throughout which can add some break-in time. We are sure you will also love the waterproof feature of these boots which will keep you dry and protected. We appreciate your recommendation and your loyalty to the HAIX brand. 2nd pair in 8 years love the product. Thank you for your review of the Airpower XR1, FS. We are pleased that you love our boots and that they have served you well over the last eight years. 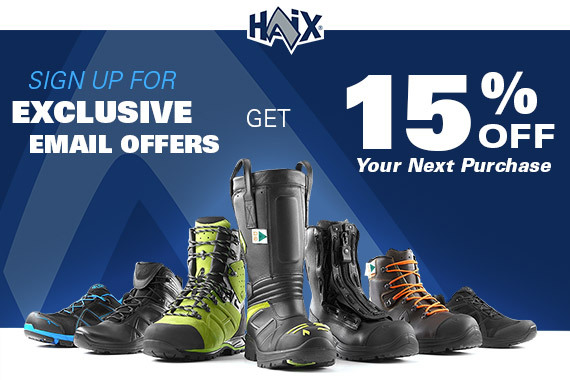 We appreciate your loyalty to the HAIX brand and hope you will remain a loyal customer for years to come! Well made station boot. I purchased this boot specifically for the NFPA 1977 certification. Very comfortable with a roomy toe box. Great food bed and arch support. Good ankle support and short break in period. I am using this on the job at a Structure FD with significant urban interface areas. My only concern is the zippers are getting tough to pull so time will tell how long they last. We appreciate you taking the time to review of the Airpower XR1, FS. We are happy to hear that your feet our comfortable and supported while on duty. If you have any further problems with the zippers, don't hesitate to call our Customer Service Dept. to assist you in finding a solution to the problem. Thank you for your service and for choosing HAIX! Had them as FF/EMT with Honolulu Fire Dept. Moved to Missouri and joined a volunteer department. Decided it was worth investing in boots for my own comfort. As soon as I slipped them on, I knew I had made the right choice. Thanks for manufacturing such a great boot. Thank you for taking the time to review the Airpower XR1, FS. It's good to hear that you are happy with the high quality of our boots. We hope they continue to serve you well in the future. Will buy another pair in a few years!! Thank you for taking the time to review the Airpower XR1, FS. We are happy to hear that they have served you well in various activities while on duty. These boots can take a while to break in due to the full grain leather used throughout but we are glad that you waited it out. We appreciate you loyalty to HAIX. Stay safe out there! Thanks for your feedback on the Airpower XR1, FS. Glad you like the boot and our company! We appreciate your support! Currently I work as a Security Officer and EMT. I was referred to HAIX by a paramedic that I worked with, as I was wearing some cheap knockoff boots. 200 dollars later, I got my Airpower XR1s in the mail. When I put them on and walked around in them, I hated how stiff and rigid the boots were. I wore them for 3 days and got huge blisters on my big and pinky toes on both sides. I contemplated returning them, but decided to keep going. I had a pair of Danners that broke in pretty quick a few years ago, so I figured it just needed time. Within a week these boots became the most comfortable boots I've ever owned. Most daysuccessful, after standing or walking for 8 hours, my feet don't hurt like they usually did with cheap boots. These boots have resisted water, oils, soda, booze, diesel and so much more in the short amount of time I've been wearing them. I would definitely recommend these boots to anyone who needs a good pair of boots! I will definitely buy another pair when these wear out! We appreciate you taking the time to share your experience with us on the Airpower XR1, FS. These boots can take a little longer to break in, due to the thick, full grain leather used throughout so we are happy to hear you stuck with them and now find these to be the most comfortable work boots that you've ever worn. Thank you for recommendations and your customer loyalty. These boots are fantastic! I am a firefighter emt and I wear these boots everyday at work. They're comfortable and definitely feel like they belong on the job. I would say I am very comfortable with trusting these boots with my foot and ankle safety. The only issue I had with them is this, the insoles they come with are paper thin and offer no cushioning or support. You will need to replace them. The only other problem I had was the laces were pretty weak on them so I replaced mine. Both of these problems are very easy to fix and wouldnt come close to stopping me from buying another pair. Overall I would highly, highly recommend these boots. We appreciate you taking the time to share your experience with us. We are happy to hear that the boots have served you well on the job. Sorry for the minor issues with the insoles and the laces but we appreciate you not letting it ruin your opinion of the overall quality of the boot. Thanks for all you do. Stay safe out there! Thank you so much for the positive feedback on your Airpower XR1, FS. We are happy to hear that they have served you well for the past three years and hope they will continue to do so in the future! I'd ordered these after wearing the Rocky and Corcoran uninsulated boots for nearly a decade, so to be honest I wasn't prepared for what I got. They're sturdy, but warm!! Boots showed up sooner than expected, still cannot find the imperfection that made them factory seconds. I work as an EMT, am going to paramedic school, and a volunteer firefighter. I wear these boots 5 to 6 days a week all day and have been comfortable since day one. I would recommend these to anyone on their feet all day.